This is a year of birthdays that feel significant, some because the number attached has some particular importance--18 & 13 arrive this year--some, like this one because of the combination of age and person. 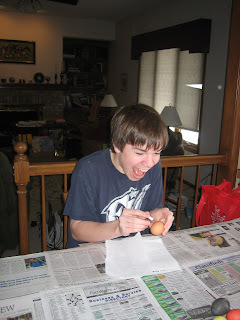 Fifteen years ago Jonathan Max was born in a suburban Chicago hospital. He was almost two weeks past his due date when he finally decided he didn't have enough cartwheel room left in there. He started life off by scaring us all. He made his appearance with the umbilical cord tightly wrapped around his neck and a blue face. Thanks to our doctor's quick action, this was quickly remedied. Jonathan's initial Apgar score was 3, but by the time they did the five minute test it was 9. Jonathan--later to be known as Boo-Boo--was the easy baby. He was an easy toddler. He was an easy child. He has always had a sweet, cuddly personality overlying a core of iron will. As he gets older the iron will seems to peek through more often, but I think that's how it's supposed to be. He has a gorgeous voice. He is a huge help to his mama. He has a fantastic imagination. He's the middle boy and has long been buddy of choice for both brothers. Fifteen seems a lot older than fourteen. My sweet boy is becoming a young man. He's finishing his first high school year. He's making plans for the future, and will be attending music camp in Wisconsin this summer and Christ Academy at the seminary. He's growing up. The Supreme Court announced its decision on the Indiana Voter ID law today. Amazingly, common sense won the day. The state can require a photo ID from voters on election day. Indiana has tried to make this as easy as possible. They have made free ID cards available for non-drivers. Nursing home residents who vote at their nursing home do not need ID. A voter who forgets his ID can cast a provisional ballot and has ten days to prove their identity. I have worked three elections since the voter ID law passed. I worked at a polling place--in a nursing home--that took in three of the poorest precincts in the city. I have never yet seen a voter turned away for lack of ID. We had a couple of people who had to go back out to their cars to grab ID. We didn't have one complaint. People thought it made sense. They were mostly poor people, mostly black and hispanic, mostly democrat, in short, those who the critics say this law will hurt. This election I will be running another precinct of the same sort. I'll let you all know if there are any problems, but I don't anticipate any. Some of the responses to my post about sleazy prom dresses take issue with the prom itself. For the record, I love the idea of the prom. I went to four. 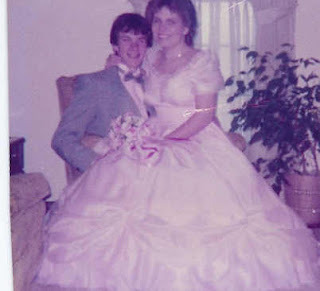 (The grainy picture is of me in my pink Nadine formal with a four-bone hoop that I wore to my senior prom. The cute young guy is now my hubby.) There's not much I like better than getting really dressed up for a nice evening out. I was quite excited for my daughter when she got to attend the prom with a friend from church. It was an interesting experience, and she got to wear a beautiful dress. Shopping for it was a challenge, but we got really lucky and found a beautiful $700+ dress marked down to less than $100 because of some slight damage. I am glad that when she went it was with a friend. That takes away a lot of the worries for mom and dad. I do think that there are problems with proms. Often these are because--as with the dresses--parents aren't being parents, they're being buddies. So they let the group of couples go spend the weekend at the lake cottage unchaperoned. They charge the cost of the limo so that the kids don't have to drive. (One mother I know told me, "I know they're going to get trashed. It's part of prom.) The expectation of many parents seems to be that their teens will misbehave, so they will make sure they're relatively safe doing so. A couple of years ago there was an ad for color-coordinated underwear for prom. Very skimpy stuff to match the dress. Exactly who was supposed to be seeing this? I'm having fun with this whole reading challenge thing. But I have some problems. One, I read too many mysteries. Two, I keep going to the bookstore and adding to my to-read pile. Three, I am lazy. Thus, I am tempted to replace the classics with yet more fluff. I must not give in to this temptation or these books will languish on my shelf for yet another year. Hmmm...guess this is why it's a challenge. Another of my children has started a blog. "Don't those girls have parents?" THAT was the question on my lips last Saturday night while waiting to be seated at Biaggi's. We were subjected to some of the most awful prom dresses that I have ever seen. This site, which is the first result in a google search for prom dresses will give you a clue about the kinds of dresses we saw. Lots of sequins and satin, but mostly lots of skin. We saw cleavage on high school girls that would have been risque on a pop star. Lots of dangerously low backs and cut outs in bodices. On the other hand, we also saw some girls who looked beautiful, in dresses that were lovely and fashionable, without being skanky. As the mother of teen boys, I can emphatically say that they would not leave the house with a girl wearing some of the dresses we saw. As the mother of a 21 year old daughter, I know how hard it can be to find fashionable clothes that are modest. But we have to raise our daughters with enough self-respect--and respect for others--that they understand that the message those kind of dresses are giving isn't a positive one! I'm not suggesting they need to dress like this. (Although that might be fun!) I am just suggesting that some of these girls could really use some parental guidance in the way that they dress. And maybe there are a few parents out there who need a reminder that it's okay to tell your kids no. I love the eloquence of times gone by. These are arguments that have been part of many gun control discussions in which I've taken part, but I love the way he makes them. I don't think that Cesare--or Thomas Jefferson--would find much to like in our ever-expanding nanny state. We had a bridal shower for Bean on Saturday. I spent the two days leading up to it cleaning my house and fixing food. Saturday morning was spent frantically assembling food. After the shower, my dear hubby took my friend PPP--who was tremendously helpful in getting the food together and also provided me with the photo-- and I out of for a much-needed relaxing dinner. Sunday was our semi-annual voters meeting at church, followed by a brief nap. The nap was needed because Sunday night was Bunko. It was a record-breaking Bunko night for the Redeemer ladies! We had 23 people! Twenty played while the others swapped in and out of the game or just talked. I don't know the last time I've laughed that much! I've got a couple of blog posts swirling in my brain. They may make it out today. It's not often we get to feel an earthquake. The only other one that I remember was in 1987 when we were living in Anderson. It is rather strange to wake up and feel your bed shaking and hear the house creaking. None of our kids woke up, and Bethany was disappointed. She also missed the one significant aftershock that we had at 11:30. The USGS website has some cool information on it. I hadn't looked at it before, but I went this morning and reported what I felt. I just got back from a visit with my good friend Susan. There's nothing like a visit with Susan to make me ready to turn over a new leaf in some area of my life. Susan often thinks she's not getting anything done, but she blows me away! While I was at her house she washed all of the sheets--at the laundromat, no less--hung them on the line, and made an unplanned tasty, balanced, homemade dinner, in an hour, from ingredients that were in her house. She made homemade tortillas for lunch-time burritos. And interspersed in all of this she posted to her blog a couple of times, hung out with me for hours. This was all in about 27 hours, and I'm assuming she slept. The tortillas were awesome, and I have to try to make them for my family. But the thing that made the most impact on me this time was that dinner and lunch were eaten at the table with everyone who was home. We almost never manage to eat at the table together. So the first day after I got home I cleared off the table and we all ate together. It was very nice. Unfortunately, for us, it's a rare occasion, but it's one of those new leaves I always want to turn over after I hang out with Susan. I'm having a visit with a friend for a couple of days. Maybe spring will have sprung when I come home. Folks are making a road trip to Saint Louis tomorrow to show their support for Issues, Etc. Looks like the people at the Purple Palace know they're coming. The Issues programs dealing with Life issues are all collected here. The petition now has over 7,000 signatures from all over the world, and--from some of the names on there--a good cross-section of the synod. The discussion continues on the Wittenberg Trail, including in this blog post. Today I finished my taxes. I spent two hours at my desk wishing that I could listen to Issues, Etc. while I worked. It got me ticked off all over again. This book reawakened a desire that I had all but forgotten. I would love to enter the Pillsbury Bake-Off. Heck, even some other cooking contest would likely suffice. But reading this book reminded me that I used to dream of what I would make for one of these competitions. I had never read many memoirs. A few years back I read A Girl Named Zippy and enjoyed it. A couple of years later I picked up a sequel to it, She Got Up Off the Couch. About the same time I picked up Bitter Is the New Black. Shortly after that came Angela's Ashes. I was hooked on the memoir. It's gotten to the point that I read almost as many memoirs as anything else. So when I saw this one, about a writer who also cooks, I knew I had to read it. It was good. I was definitely drawn in, but I didn't feel the connection to Ellie Matthews that I so often feel to memoir writers. I think maybe she was a bit too much of the self-consciously unconventional west coaster for me. But I read it at the same pace I would read a James Patterson or Faye Kellerman book and almost the pace that I'd read a Lee Child. So I guess that means I enjoyed it. If you don't yet subscribe to Gottesdienst, here's more enticement. Oh my. When I read this last night, I laughed so hard that I was choking. A couple of stories today really caught my attention. This one is distressing. What makes kids think these kind of things are okay? Why do they do this? I've heard some pundits talking about how they want fame. They don't care why. Then there's this one. I cannot count the number of times that I've called my kids or my nieces monkeys when they are climbing trees or simply being goofy. It's just one of those things people say! And, while we're talking political correctness, this one. I've got a rule. If I take a test, I have to put the result up, no matter how silly I think it is. Don't worry - everyone knows it's not easy being green. Before I start, I want to warn you that if you pick up He Said Beer, She Said Wine, you'll want to read it with a glass of wine or beer in hand. I was pleasantly surprised when I got a book on my very first try from LibraryThing's Early Reviewer program. I laughed when I saw that it was a DK book--that is, a book published by Dorling Kindersley Publishing--because I have hundreds of DK books. Once upon a time I sold them, and shortly after I laid in a big stock for a book fair, they shut down our division with almost no notice. So I have a bit of a love-hate relationship with DK. I still love the books, but I'll probably never like the company. The first thing I noticed when I opened this book was that it doesn't have the DK look. I have noticed lately that they are going away from this, with many of their books and I find it sad, because, in my opinion , that was what made them great. All of that stuff aside, I liked this book. On the other hand, the suggestions for pairing with some foods have made me resolve to try some new beers, and to revisit a couple of wines, particularly merlot. I also plan to try some of the recipes that they offer for pairing with wine and beer, possibly in the context of a "beer versus wine party." This is a dinner party at which guests are given the opportunity to taste a beer and wine with each menu item and vote on which is the best. Sounds like fun to me! The back and forth between the authors was a bit much for me. The "debate" felt contrived, but I mainly skipped those parts as the book went on. This is one of those books that I can see returning to again and again, both for specific suggestions and for its general information about the flavors and characteristics of various beers and wines. If you've wondered where I am, the answer for the past couple of days has been the church basement. We're having a rummage sale for the youth trip this summer to Turkey Run State Park. If you're in Fort Wayne you can come buy junk until 1:00 today. I knew it would be a fluid thing, but today I made more changes in my reading challenge list. First, I needed to include the free review copy of He Said Beer, She Said Wine because I need to get it read and post a review. I also found some good deals on a few books that I have been wanting to read, so I'm adding those. I have an Amazon order coming this week, so it will likely change again. I spent today with my nieces at my mom's house. It was just a garden-variety fun day with family, but I was reminded again of how very much we have to be thankful for. If you were reading my blog in December, or if you know me well, you will remember that we nearly lost my niece Abby to a blood clot in her brain and that her recovery has exceeded our wildest expectations. I couldn't help but think as she climbed onto my lap after her turn bowling that things could have been so different. Not only is she alive, but she is almost completely back to normal.